Caught plenty of bait this morning and picked clients up at 5:30 am . Found our first school of Stripers within 5 minutes in 26' of water and put downlines on them. Before we got 4 lines out the fish started hitting the baits and for 15 minutes it was all we could do to keep baits in the water. Once the school looked like it was thinning out I would move on the big motor , relocate them again and do it all over again. By 7 am we had caught 20 fish so we decided to leave that school and find another school maybe with bigger fish in it. We hit on 3 more schools, catching Stripers and leaving them. We ended up fishing a huge school in 35' of water and using all of our bait up. 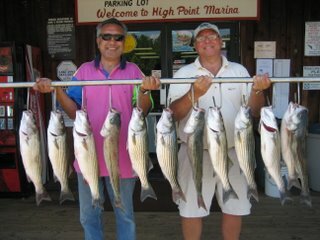 Clients caught over 50 Stripers and a dozen Cats, keeping 12 nice fish to take home.